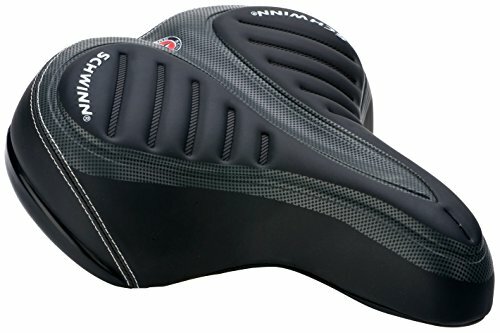 The Schwinn Pillow Top Cruiser Bicycle Seat allows you to enjoy maximum comfort while cycling. It is fitted with enough gels for superb comfort and it is covered with a lycra material which offers superb weather resistant properties. This product offers a complete addition to casual bikes, mountain bikes and cruisers. A cruiser styled bicycle seat which provides maximum comfort during rides. Covered with Lycra material that offers protection from harsh weather conditions. Compatible with casual bikes, cruisers and other bike types. The Schwinn Pillow Top Cruiser Bicycle Seat offers the perfect solution to cramps from long rides. It is designed to provide a comfortable, but firm riding surface supported with well-matched springs and a frame that is stable. The curvatures are well positioned in the right places and it features bumpers made of rubber at the back that acts as decent shock absorbers when the ride gets bumpy. It comes with a groove in the middle for the balls to hang in safely and cuddled with soft gels for protection. Weight wise, the seats are light for the size it comes in and this is due to the very dense urethane foam. The seat suffers from poor ventilation because of the covering material. The top cruiser bike seat comes at an inexpensive price and although, the features are not much as compared with other seats, however it does a decent job of providing comfort without compromising protection.